A shoring system protects workers when they are performing tasks around structurally unstable trenches or buildings. As you are planning out your shoring erection, it is necessary to calculate the appropriate distance between each vertical shore. If your vertical shores are spaced too far apart, your entire installation could be structurally compromised. The spacing and placement of your vertical shores will depend on several factors, including the thickness of your plywood, as well as the density and slope of the surrounding soil. A shoring system professional will be able to make accurate calculations for your vertical shore placement. If you have questions about planning a shoring erection near Washington, D.C., contact Scaffold Resource . For more than two decades, we have provided local businesses and landmarks with quality construction scaffold and shoring system installations. To set up a consultation with our scaffolding experts, visit our website or give us a call at (301) 924-7223. 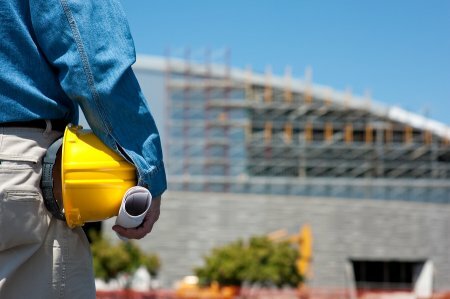 As a new construction worker, you will undergo extensive training for your role on the jobsite. In order to remain safe on a scaffold and accomplish your tasks efficiently, it is important to educate yourself on some of the most essential construction terms and phrases. After you have learned about the parts and components of a shoring system and other scaffolding devices , you will be ready to embark on your new career. Here is an overview of some essential scaffold terms that all new construction workers should know. A safe scaffold installation usually relies on counterweight in order to achieve stability. After the scaffold has been erected, a team of technicians will place counterweights that allow the system to balance on either side. The counterweights are designed to keep the scaffold upright and prevent it from tipping over. In order to work safely on a scaffold, you will need to be able to identify potential hazard. A hazard is any situation or material that could potentially cause an accident or injury for workers in the surrounding area. If your supervisor warns you of a potential hazard, you will need to fix the issue before you start work on the scaffold. When you perform work while standing on a construction platform, it is very important to be aware of the safe working load of your equipment. A scaffold’s safe working load is the maximum level of weight that it can support without being in danger of collapsing. As you calculate your safe working load, you will need to factor in your body weight, as well as the weight of any tools and materials that you will be using. 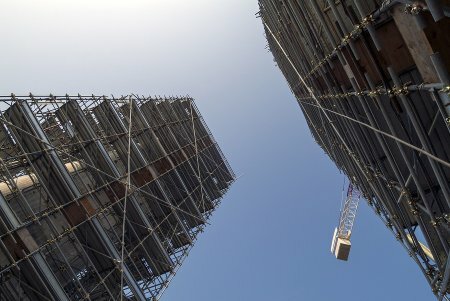 If you are seeking a safe and stable scaffolding rental serving Washington, D.C. , look no further than Scaffold Resource. We provide our clients throughout the area with top quality scaffold resources, and we can help you learn about all of the terms that are related to your construction scaffold. To learn more about our training program, give us a call at (301) 924-7223. When you are performing work that requires shoring erection, OSHA guidelines require that there is a competent person on site at all times. 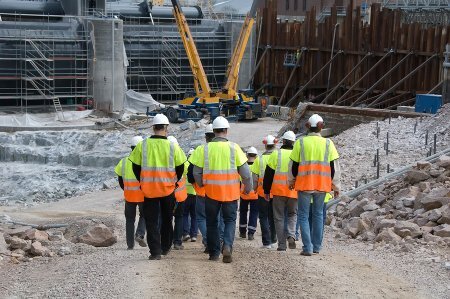 A competent person is a workforce leader who has the training and knowledge needed to identify and correct potential safety hazards during a trenching or shoring project. If you are getting ready for a shoring system installation , read through this daily inspection checklist that is tailored to the competent person on the jobsite. Any job that contains a shoring system needs to have protective systems in place to prevent accidents and injuries. During the daily duties of a competent person, he or she needs to continually monitor the quality and condition of these protective systems. Some examples of systems that need to be checked throughout the workday include water removal devices, soil deposits, and shoring systems. Trenches can pose a serious hazard when they are not excavated and stabilized correctly. As a part of the daily inspection checklist of the competent person, he or she will need to take a close look at the condition of all trenches that are being used during the project. If a safety issue is revealed, the problem should be addressed immediately. Workers also need to be able to safely enter and exit their trenches and equipment. One of the primary roles of the competent person is to evaluate these access points for signs of deterioration and damage. The competent person has the authority to order repairs on any structural or safety issues that are found within the access points. At Scaffold Resource, our team of experienced professionals can assist you with your shoring erection near Washington, D.C. From scaffolding to shoring rental and more, we offer the equipment that you will need to accomplish your next project. Give us a call at (301) 924-7223 to learn more about how we can help you install and maintain a quality shoring system. When you erect a scaffolding rental, your workers will have access to elevated areas throughout your jobsite. A personal fall arrest system is required for any worker who is required to perform tasks on a scaffold platform that is less than eighteen inches wide. Personal fall arrest systems are also required for situations when workers must perform duties on a crawling board or during high wind conditions. In order to meet OSHA safety standards, the personal fall arrest system must include a body harness, secure anchorages, and vertical lifelines. Learning to use a personal fall arrest system correctly will help to ensure the safety of workers when they are operating on a scaffold. At Scaffold Resource, we can provide you with safety equipment for your construction scaffolding in Washington, D.C. With our high safety standards, we are a leading provider or scaffolding rental and shoring systems in the local area. Give us a call at (301) 924-7223 to learn more about how we can help you create a safety system for your scaffold.